A collection of Kate-inspired accessories. In honor of the completed (and very successful) Royal Tour of New Zealand and Australia that Kate took with the Princes William and George, I thought I’d take a tour of my own closet, once again, to see what accessories I can come up with that are similar to Kate’s, without spending a dime. 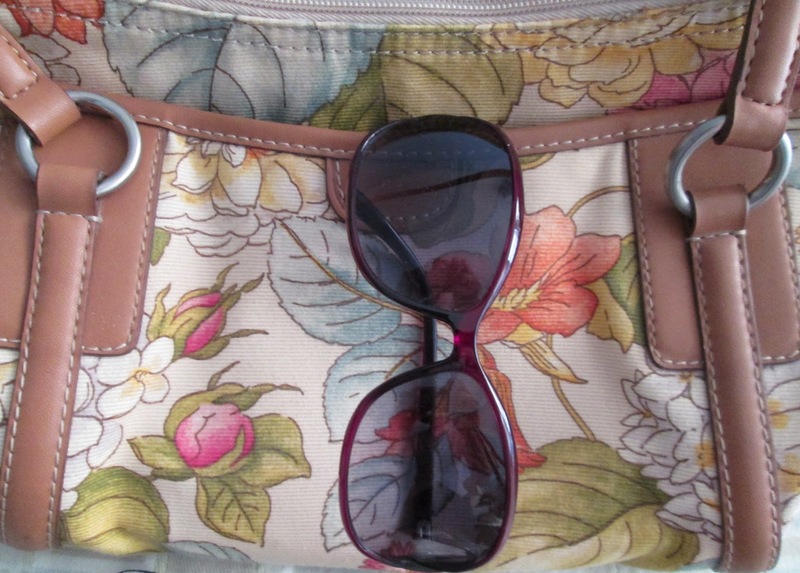 Fossil bag, Simply Vera sunglasses. Avignon tote by Fossil. I don’t own a Longchamp Le Pliage tote like Kate so this is going to have to fill in for one. I haven’t used this in awhile and yes, it’s true, I forgot I owned it, but I like all the flowers on a pale background for summer so it’s like I found a new bag in my closet, which is always fun. Purple sunglasses by Simply Vera. I do love Kate’s Givenchy sunglasses and may break down and buy a pair myself someday, they are such a great shape. While I ponder that purchase, my $20 special by Vera Wang for Kohl’s will do just nicely. Kate with Pippa. Kate’s sunglasses are Givenchy, SGV 773 if you want the model number! Fossil watch, ruby and diamond ring, diamond pendant, Mademoiselle by Essie, Zara blazer. Fossil watch. I really like Kate’s Ballon Bleu de Cartier watch and God knows I want a Cartier watch too, but the Tank Solo is much more in keeping with my style and personality. I bought this Fossil watch not too long after moving to Manhattan in 1996. I loved the blue face, still love it in fact, and this has easily been the best watch purchase I have ever made since I have been wearing it faithfully since I bought it. Until my Cartier dreams come true, this watch works for me! Ruby and diamond ring. Of course, Kate has Diana’s lovely sapphire and diamond ring to wear. My version is a 30th birthday present from my husband. I never get tired of its vintage feel. Kate with her engagement ring. Love the pale manicure! Photo by Chris Jackson. Essie polish in Mademoiselle. Kate normally goes for no polish or a very subdued manicure so if I want that Kate look I would pick the Essie classic Mademoiselle. You can barely tell it’s there! A very simple necklace on Kate. Photo by Daniel Kalisz/Getty Images. 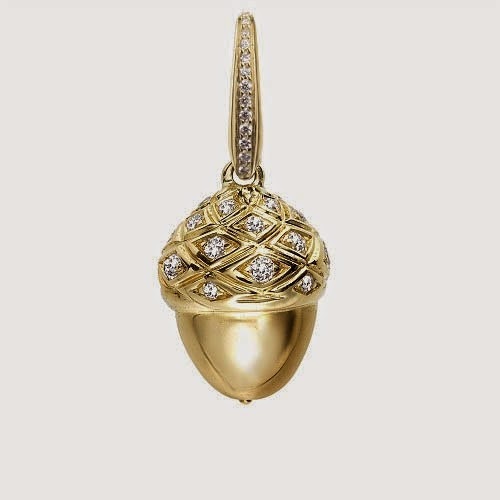 An acorn charm by Asprey. Diamond pendant. I’ve noticed Kate goes for simple necklaces, such as the Asprey Woodland charms she wore on tour. My diamond pendant, an anniversary gift from my husband, is my everyday version of simple! A great wedge sandal by Kelly & Katie. So great for summer! Kelly & Katie Wedge Sandals. I bought these from DSW a couple of summers ago and I look forward to wearing them every year. 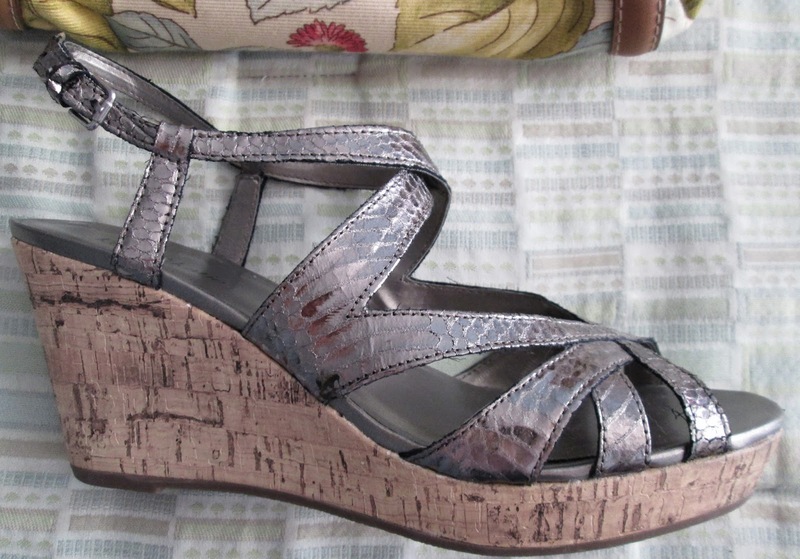 It’s so fun to be an Amazon and tower over others when I wear these sandals, which put me close to 6’0, whee! I know Kate loves her wedges and I know why—you get the height, that very fun late 70s glam feel, and they are comfortable (and walkable) too! Kate in Zimmermann. PA photo. Now that the tour is over I can say that my favorite look of Kate’s, by a mile, was her off-white eyelet dress by Zimmermann. It was easy and feminine and gorgeous. Which kind of accessories do you like on Kate—Full-On Duchess, with tiaras and such, or Easy Chic? Once again, I have to tip my hat to What Kate Wore and Duchess Kate for their fantastic and non-stop work covering the tour and ID’ing everything Kate had on. I also love that they help each other in the process of identifying Kate’s garments, accessories, and jewelry. Talk about bloggers who believe in teamwork! Good job, Jill...really enjoyed the post. I am going to check out those sunglasses! She chose so many fun clothes and accessories and I liked how she mixed high and low together. 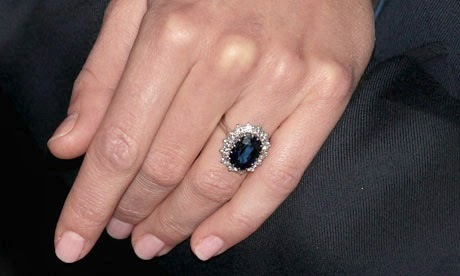 I have a sapphire and diamond ring like Kate's (Diana's) and I really must wear it more often. You have some great accessories too and one needn't break the budget to feel suitably attired and you have proved it here. Great post! Such a great idea for a post! I love Kate's style. She never gets it wrong and now I feel inspired to add some Kate-ish touches to my outfits!